Product categories of HDI PCB, we are specialized manufacturers from China, Electronic PCB Board, HDI PCB suppliers/factory, wholesale high-quality products of HDI Printed Circuit Board R & D and manufacturing, we have the perfect after-sales service and technical support. Look forward to your cooperation! HDI PCB refers to high-density interconnect Printed Circuit Boards. 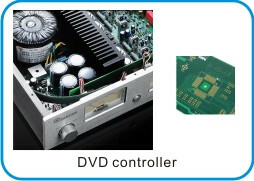 HDI Board is a key part of the PCB and electronics industries increasingly. Electronic components become smaller and lighter, however still require ever-improving performance. To adapt this situation, people have to pack more functionality into a smaller area. Many functions are improved by HDI Printed Circuit Board, such as denser trace routing is denser, power is more stable, interference inductance and capacitance effects is reduced, signal integrity in high-speed design is improved. That`s just HDI PCB can do! Size and weight of products can be reduced. Consumer Electronics, such as laptops, smartphones, tablets, and wearable, as well as other consumer electronics like digital cameras and GPS devices, smart thermostats, fridges and the many other connected devices available. Communications: such as routers, switches, modules, and semiconductors. Digital video and audio equipment, etc. Automotive and Aerospace: Cars are becoming more connected and computerized. About 50 microprocessors on board that play a role in engine controls, diagnostics, safety features and other conveniences for cars today. Also on board Wi-Fi and GPS, rearview cameras and backup sensors rely on HDI PCB. Medical devices, for example, imaging, monitoring, surgical procedures, laboratory analysis, and others.